Ouch! The job market suddenly looks a lot weaker than economists' had thought. Hiring slumped sharply in December, as the economy added only 74,000 jobs, according to the government. This was the weakest month for job growth since January 2011 and came as a huge surprise to economists, who were expecting an addition of 193,000 jobs. 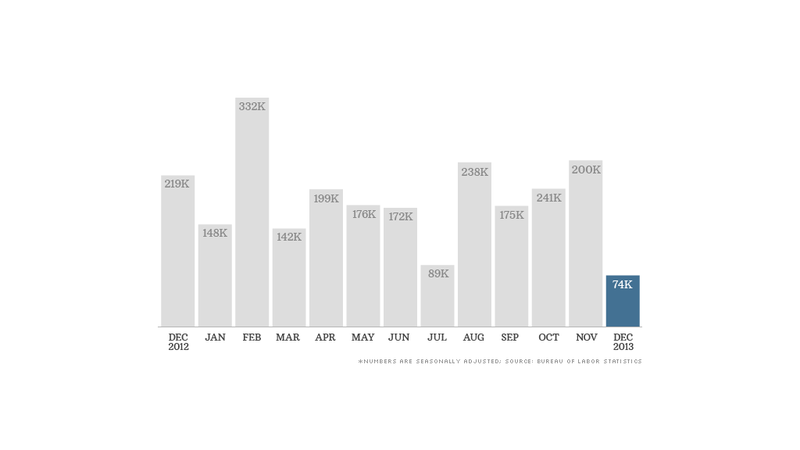 For all of 2013, the economy added 2.2 million jobs -- on par with 2012's gains. Some economists believe December's weak job gains could be a fluke, given other solid data recently. They expect the government to revise the numbers higher in the months ahead. "Just about every other measure of job growth suggests that employers are either hiring or intending to hire, extending hours and laying off fewer people," said Tim Hopper, chief economist for TIAA-CREF. "Let's not panic," said Heidi Hartmann, president of the Institute for Women's Policy Research, adding that "it's not a horrible year, all things considered." The government also noted that "unusually cold weather in parts of the country" could have had some impact on construction jobs for example. That sector lost 16,000 jobs in December. Meanwhile, the unemployment rate fell to 6.7% in December, but the drop came mainly from workers leaving the labor force. Job market dropouts could be doing other things, like retiring, enrolling in educational programs or taking care of relatives. But many have simply given up hope of finding work. Only 62.8% of the adult population is participating in the labor market now -- meaning they either have a job or are looking for one. That matches the lowest level since 1978. In the job market's 2007 heyday, unemployment was under 5%, but in the two years that followed, the recession wiped out 8.7 million jobs. To this day, not all those jobs have returned. "We're going to have a long-term unemployment crisis for a long time," said Heidi Shierholz, economist with the Economic Policy Institute. 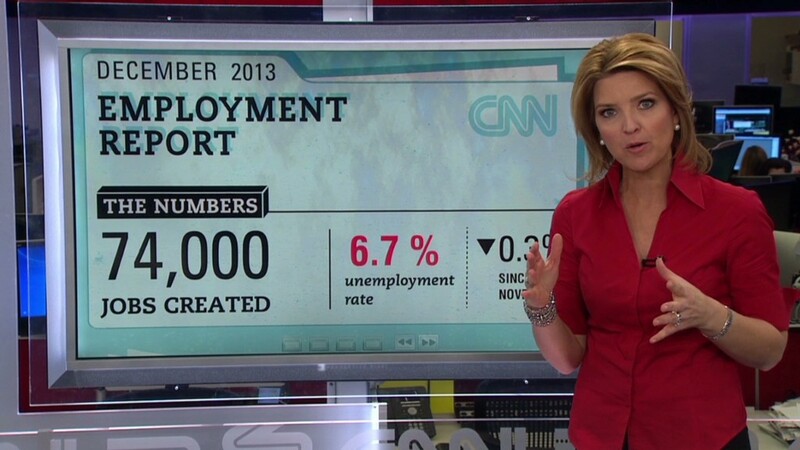 Along those lines, CNNMoney has talked to several people who have been unemployed for a while. Jamie May has been looking for a job for more than a year. Formerly a senior manager for a corporate housing company, she had a comfortable six-figure salary before the recession hit. But since then has been laid off three times. "There are days I'm numb," she said. "The mental toll -- the depression -- the feeling of being unworthy and unwanted, after being highly successful. I just want a job." Based in Austin, Texas, she has submitted applications for positions around the country, and has even indicated she would be willing to take jobs in the $30,000 to $40,000 range. "The feedback is -- 'you're great, you have the credentials, but we want someone who knows the local market.' Or, ' we're concerned you'll leave when the economy picks up and you get a better offer,'" she said. Fred Royal in Houston used to work as an administrative assistant for a grocery chain. He lost his job in March, and gets the same message in interviews. "Many have said they think I will leave for a better paying job," he said. "Better paying job? I can't even get one job." Both May and Royal were among the 1.3 million Americans who received their final check in federal unemployment benefits last week after Congress agreed on a budget that left out the recession-era program. Democrats are pushing for an extension of the program, but Republicans insist on finding a way to pay for it through cost-cutting elsewhere. The haggling over budget cuts versus aid to the still fragile economy exemplifies the ongoing tension between Washington policymakers. While Congress has largely focused on reducing government spending, the Federal Reserve has been pumping trillions of dollars into the economy in an attempt to help the job market. Fed Chairman Ben Bernanke will end his second term at the central bank later this month without reaching his goal of "full employment." "The recovery clearly remains incomplete," he said in a speech last week, blaming part of the problem on government policy. "Excessively tight near-term fiscal policies have likely been counterproductive," he said. The federal government has cut 98,000 jobs over the past three years, not including the Postal Service, which is independently funded but has also been slashing jobs. The Postal Service workforce is around its lowest level since the 1960s. Mark Zandi, chief economist at Moody's Analytics forecasts it could take until the end of 2016 to get to a 5.5% unemployment rate. Shierholz calculates it could take even longer to get to a pre-recession job market -- when unemployment was below 5%. "Even if we did have 200,000 jobs a month, we would need five years to get there," she said. Are you unemployed? Share your story with CNNMoney's Annalyn Kurtz. - CNN's Ted Barrett and CNNMoney's Jen Liberto contributed reporting from Washington, D.C.